Nationally renowned wrestling coach Bill "Red" Schmitt started his amazing career with champion wrestlers at Western Military Academy in Alton. 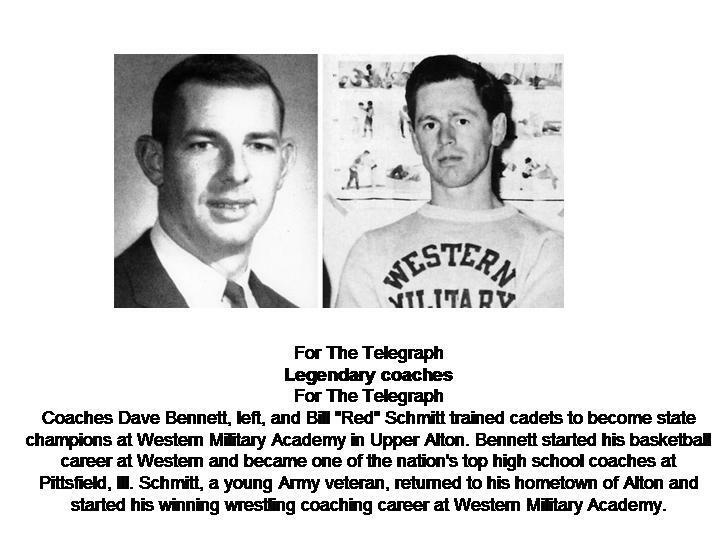 Schmitt and basketball legend Dave Bennett are two of the famous coaches who trained cadets to become state champions at the historic Western Military Academy in Upper Alton. "Western Military Academy was a training ground for some of the country's top athletes," said C.B. Jackson, a 1968 graduate of Western and author of the book "Western Military Academy Athletics." Jackson's book shows dozens of photographs of star athletes at Western from the time the academy was founded by Albert M. Jackson in 1879 in Alton until it closed in 1971. Schmitt came to Western in 1947 to coach wrestling and became one of the greatest coaches in the history of high school wrestling in the country. Bennett started his basketball career at Western and became one of the nation's top high school coaches at Pittsfield, Ill.
Schmitt graduated from Alton High School as a champion wrestler and served a tour of duty in Italy in World War II. Schmitt, a young Army veteran, returned to his hometown of Alton and started his winning wrestling coaching career at Western Military Academy. A photograph of Schmitt and his champion 1948 wrestling team is shown in Jackson's history book of Western Military athletes. Five of the wrestlers on the 1948 team wrestled in the finals of the state high school competition. "The best wrestling teams in Western Military's history were coached by Bill 'Red' Schmitt," Jackson wrote in his book. Seventeen-year-old cadets learning military tactics at Western Military respected Schmitt because of his service in World War II in Italy. Schmitt and his wrestlers had winning seasons in 1947-49. One of the wrestlers was Bill Grimm, son of Chicago Cubs manager Charlie Grimm. "I learned to coach during my years at Western Military Academy," Schmitt said after he retired from his award-winning career in wrestling. After building Western into a powerhouse in wrestling, Schmitt coached at Granite City High School and was in the national spotlight as a winning wrestling coach. He was a role model to his young wrestlers and some followed in his footsteps in careers in coaching. "Coach Schmitt is the reason I chose coaching," said Greg Garland, an assistant wrestling coach at Alton High School. Garland was a wrestler on Schmitt's champion Granite City wrestling teams. "Coach Schmitt had a tremendous influence on the character and ability of the wrestlers," Garland said. "He taught integrity." Garland compared Schmitt to John Wooden, the great University of California basketball coach who built character and life values in his players. Schmitt was inducted into the National Wrestling Coaches Hall of Fame in Stillwater, Okla., for his remarkable career of winning and being a role model in the lives of young wrestlers. Dave Bennett, one of the top basketball coaches in Illinois history, started his brilliant career as a coach of cadet teams at Western Military Academy in Alton. Bennett grew up Martinsville, Ill., and was a star athlete on the high school teams. He came to his first coaching job in 1966 at Western Military Academy. At the school in Upper Alton, Bennett coached basketball, football, track and wrestling and was a positive influence in athletes' lives. Bennett was proud to coach at Western Military, which had a reputation of producing athletes who broke state, national and world records. Ray Ellinwood, a 1933 graduate of Western, broke the world record in the 440-yard race in a national track meet in Chicago. Bennett credited his years at Western Military as a time of preparation as a Hall of Fame basketball coach at Pittsfield, Ill., high school. The Illinois General Assembly honored Bennett for winning 527 games in his 23 years of a brilliant coaching career of the Pittsfield High School Saukees. His team was the state champion in 1991. He was proud to be inducted into the Illinois High School Association Hall of Fame in 1995. His sons, Lee and Layne Bennett, followed in their father's footsteps in coaching careers as former basketball coaches at Alton High School.